AWWWNn!!! i wish i could participate…but i live in Brazil…..
No other movie has done promo like this. Folks, we are witnessing cinematic history! And we are “part” of it! I wish there was a 7-eleven in my city. I want to live in USA. You guys don´t know how lucky you are. Here in Europe we don´t have that promos or merchandising. AND, we have to wait till August 19th to wath the movie!. I actually do… I lived in china for 3 years… But I only had to wait a month to see american movies at my theater. How did you end up in China ?? I’m not sure that the 888,888th “person” actually wins the trip. 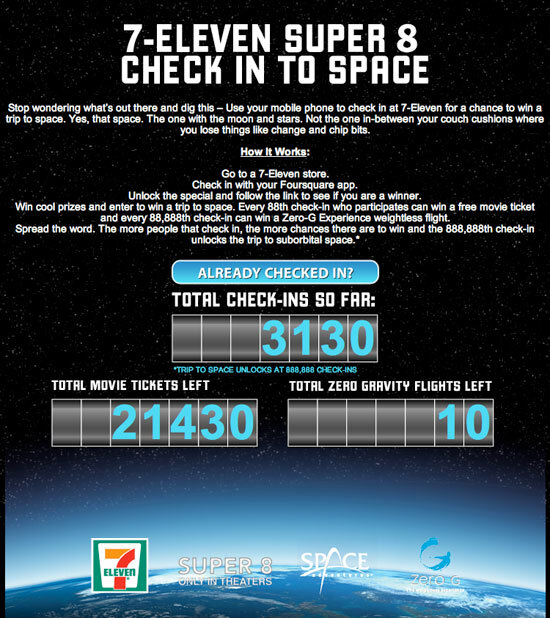 Look at the asterisk: “Trip to space UNLOCKS at 888,888 check-ins”. It seems like a misdirect, that once there are 888,888 check-ins, all people that check in after that special number will be entered for a chance to win. That’s what I’m guessing–but I haven’t seen the official rules. 5. Sweepstakes/Instant Win Game: Administrator is an independent judging organization whose decisions as to the administration and operation of the Promotion and the selection of potential winners are final and binding in all matters related to the Promotion. Sweepstakes: Administrator will randomly select the potential Sweepstakes winner, from all eligible entries on or around July 5, 2011. ADMIN… new WebPage… http://www.super8secret.com/ … it only says what is the #super8secret? …. I just sent you an email concerning the rocket poppeteers comic, there is a monster in the comic, a klartog or something, it can be controlled by “Space Cubes” which look allot like the cubes in the trailer for super 8 and in the editing room… could klartog be the monster? Yup. So i just checked in and won a “movie certificate”. Says i gotta watch my email within the next 24-48 hrs. 🙂 just thought id share. Awesome!! Got my certificate in email. Its valid for any movie with a ticket value of $10.50 i gotta say im pretty stoked!! Sweet! I just won a movie ticket too! The rules say you can check in and re-enter the contest every 3 hours. Lucky for me there is a 7-Eleven 3 blocks from my office so I don’t have to leave my desk to keep entering.